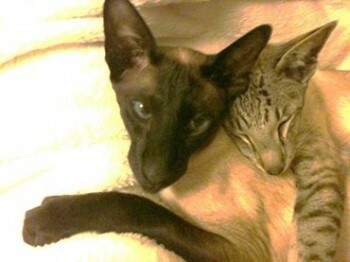 Clooney, my large, striking, male seal point Siamese was taken away from us and all he knew in the summer of 2013. A small, unremarkable delivery van pulled into our drive that morning and delivered something I hadn’t ordered: horror. Such an innocently unnoticeable every day event that would ordinarily barely register on our consciousness but for the belief that this inauspicious white Bedford van drove off with my most treasured possession: my beloved Clooney. And with it, he took away my daily source of joy, the easer of my angst and the keeper of my heart. He also drove off with my sanity. 13th June 2013 became a day never to forget; it is indelibly graffitied in all its gut-wrenching panic on every cell of my being. Time has passed, but the torment of loss without answers persists and my life today bears witness to the effects of pet theft. Many people have asked me how I have come to be so sure that my boy was taken, but it is rather the complete absence of any trace of him that eventually – too late – threw my attention to the horrific and unthinkable possibility that he had been purposely taken from us. Having worked from home, I knew instantly that something was wrong when I hadn’t heard his usually cheerful, needy little, ‘Where are you, mum?’ arrival announcement for a couple of hours. We have a strictly regulated microchip cat flap that gives outside access only after 8am (now later) and never after dark or even late evening and we live rurally, down an unmade road, far from the threat of traffic. He has a huge garden, surrounded by farm fields, to patrol or languish lazily in – it was an idyllic life that left us in no doubt that my boy would never have chosen to leave. Nor would he have chosen never to return. My big, confident and loving boy was always in and out, bossily demanding of my compliant servitude to his needs, and I was familiar with his habits just as we would any family member who had an unbreakable hold on our hearts. This little man had barged his way into mine from the day I took him home, with just the same charming, but unrelenting sense of entitlement that he displayed when he used to barge into closed rooms by leaping up and opening the heavy latch doors. ‘How dare you leave me out?’ We never did. When Clooney left us, he was part of our furry family of five who were just pets: loved beyond measure, treasured without boundaries and utterly priceless. He was the hapless but highly intelligent buffoon of a boy who had his top cat status in the pecking order only by virtue of his gentle giant size, rather than a nature that had fought for it. All was peaceful and harmonious in the basket until he left. We all fell apart that day. I hadn’t appreciated just how dependant his sister was on her big brother for her security, and with his unexplained disappearance and protection, she became wary and fearful. The hierarchy fell apart and there was a tangible, suffocating pause to their lives as they each sought to understand the Where, the Why and the What-has-happened, followed by a reluctant realignment of familial position. The negotiations were long, fractious and often smelly. We all so struggled in our own ways and I can’t amply describe how painful everything was in the wake of his loss. What became of our past lives; what became of our beautiful boy…? This is the biggest body blow that catches your breath and eviscerates your emotions. What was Clooney’s fate? Is he alive, in pain, hurt, do I dare hope that he is loved … or is he lying still and beyond reach somewhere? The one thing that I did know was that he would have been in the biggest distress. He was gloriously confident and without fear of people. Didn’t we teach him that the world was his friend… people were his friends? Love and kindness was all he had known. The tears were unstoppable for weeks… months… I did not know who had him, where he was and the unimaginable was all-too-imagined. It’s not a comfortable and rejuvenative landscape in which to wander through your dreams; the dark and threatening places that theft inhabits become shadows in your mind as we all know that no thief steals to love them. Please share and help this owner who has so elequently put in words how it feels. I am sure all owners of missing pets will share in the pain. Thank you Jayne…. for your own fight that you turned into something so wonderfully positive and invaluable; for your persistence and hard work and for your vision and belief that together we can change the outcome for the thousands upon thousands of missing and stolen pets. They need your comprehensive database, a caring team working towards their recovery and a network of people each tackling and challenging the inadequacies in the system that allow them to be swallowed up and to become invisible, despite their microchips. Hopefully things can be changed one day but DogLost has to be credited as the initiative that has raised awareness and the profile of the scale of the problem we now are facing. 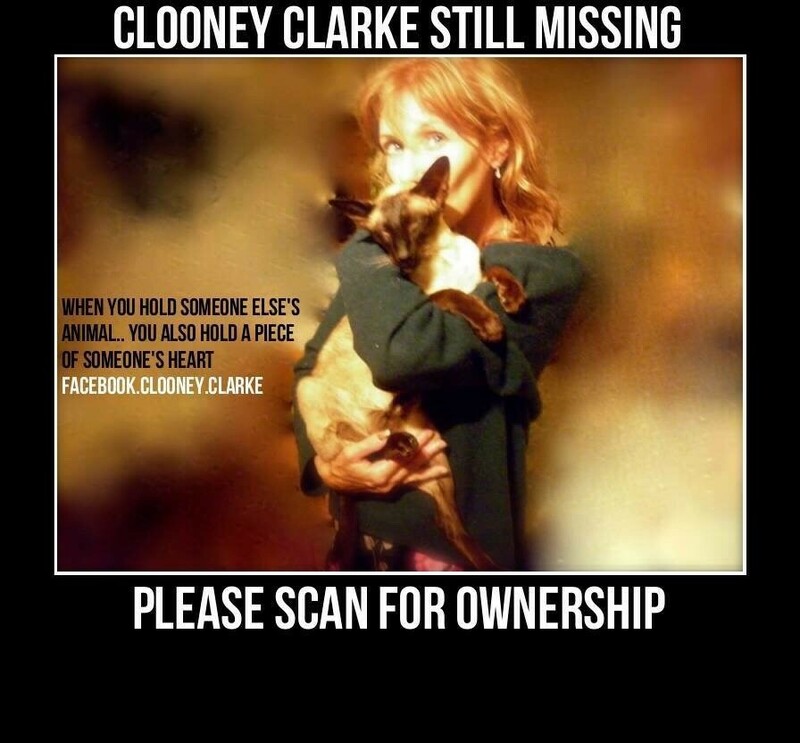 Thank you too, for recognising that owners, and our feline friends suffer the horrors of pet theft and the devastation that loss without answers entails and for giving me this opportunity to share Clooney’s story. I desperately hope to be able to write that joyous chapter of his safe homecoming. post ALL AREAS posters, as he could be anywhere. 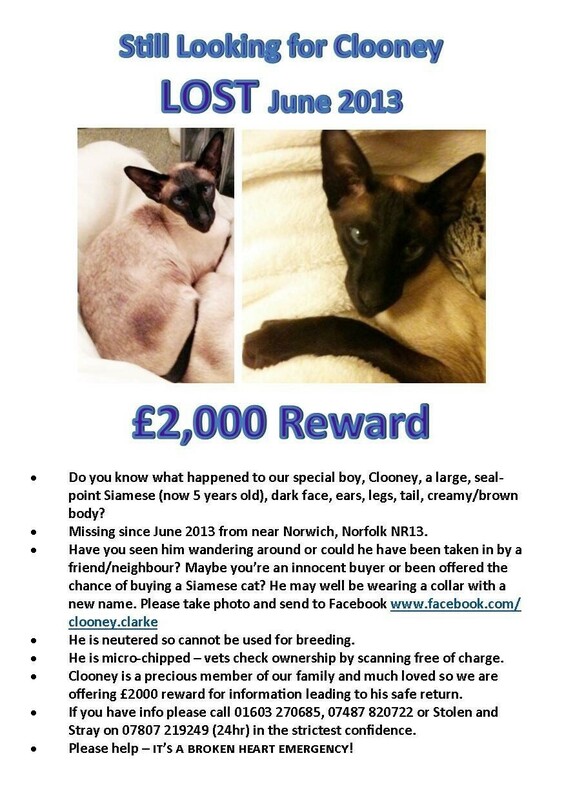 Also try a LOST CAT ad in a National newspaper. And if you could get a TV appeal to help find him too. Keep making Clooney “TOO HOT TO HANDLE” He has to be somewhere: someone must know something of his whereabouts.